There are so many terrific ongoing and upcoming exhibits at the museums in New York this fall that it’s hard to keep up. 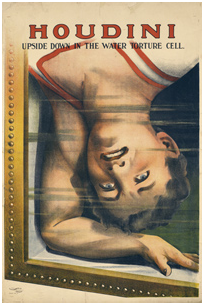 One of the more unusual shows opens next week at the Jewish Museum. Houdini: Art and Magic is the first major American museum exhibition about the famous magician and the impact he has had on visual media. The exhibit includes magic apparatus, posters, period photographs, archival films, and contemporary art work, all disclosing how Houdini inspired his audiences and continues to influence contemporary artists such as Matthew Barney, Petah Coyne, Jane Hammond, Vik Muniz, Deborah Oropallo, and Raymond Pettibon and Tim Lee, whose work is shown below. And if you get there before October 31, you can also see the Fish Forms: Lamps by Frank Gehry show. In 1983, after being asked by Formica to incorporate their new product ColorCore in a project, Gehry designed his first fish lamp. Fabricated by the New City Editions studio, Gehry produced about thirty lamps between 1984 and 1986, eight of which are shown. In 1990 he made a version using thin plate glass, one of which is in the permanent collection of the museum and included in the exhibit. 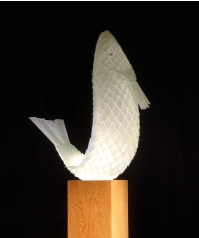 The significance of Gehry’s use of the fish form in his work is chronicled in the exhibit by an accompanying slide show. Could be a very eclectic visit! This entry posted in architecture, art, design, history, lighting, photography. Entry Tags: Fish Forms: Lamps by Frank Gehry, Frank Gehry, Houdini, Houdini: Art And Magic, Jewish Museum Bookmark the permalink. You’re right – he did look a bit like Tony Curtis. I think the exhibit looks fascinating – I’m definitely going to try to go – maybe I’ll see your son! Please please let me know about the jewelry!!! How fun to see the Houdini exhibit. We have lots of family coming through our doors between now and new year’s. It’s always great to have some fun things to take them to do/see in the city!! Yes – looks like something fun that everyone can enjoy – more next week!! 83 queries in 0.423 seconds.